Did you know about the exciting epilepsy research happening at the NATIONAL INSTITUTES OF HEALTH? NIH/NINDS is conducting clinical research that may be appropriate for you or a family member. 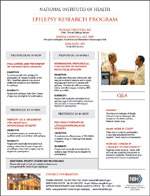 Click here to download a PDF that describes some of the current clinical research projects at NIH/NINDS. This (and more) information can also be found on the NIH/NINDS website. NIH/NINDS also has a wonderful Epilepsy information page that is well worth checking out. NIH/NINDS does extensive clinical research on their Bethesda, MD campus. You don't have to live near NIH to participate in their clinical research. To find more epilepsy related research that may be appropriate for you visit the HERO website. If you have a research project you would like us to share with the Seizure Tracker community, please contact us by email at support@SeizureTracker.com. The LGS Foundation gets a wonderful surprise from actor Chip Esten from ABC’s Nashville. - The Lennox-Gastaut Syndrome Foundation gets a wonderful surprise from actor Chip Esten from ABC’s Nashville. American Epilepsy Society highlights some of the cool science of epilepsy. - American Epilepsy Society highlights some of the cool science of epilepsy and the advances of the last 50 years. Brain Surgery for Seizures - MRI guided Laser Ablation system by Visualase. - Are your seizures under control? Do you suffer from debilitating side effects from epilepsy treatments? Have you ever thought about epilepsy surgery? Educational Webinar Program - Improving Care and Outcomes by Tracking Seizures in Those with IDD. - We are excited to be partnering with AADMD and the Epilepsy Foundation to provide a educational webinar program focused on improving care and outcomes. Seizure Tracker is thrilled to have a team for the 1st Annual National Step Forward to Cure TSC Walk! - The Seizure Tracker team will be walking in the first annual National Step Forward to Cure Tuberous Sclerosis Complex Walk! Support TSC and epilepsy related research and services by joining the team! The Seizure Tracker Team will walk in the "National Walk for Epilepsy" - The Seizure Tracker team will be walking in the sixth annual "National Walk for Epilepsy." Support epilepsy research and services by joining the team! Take the Epilepsy Foundation's "Get Seizure Smart" quiz. - Seizure Tracker has partnered with the Epilepsy Foundation to get over 5 million people "Seizure Smart" in 2011. The Seizure Tracker Clinical Trial Monitoring Tool (CTMT) launched on RAD001-Neurocognition in Tuberous Sclerosis Complex trial. - Based on the classic Seizure Tracker interface, the CTMT provides a simple electronic logging system for multi-center clinical trial enrollment. The development of this tool was funded through a grant from the Tuberous Sclerosis Alliance. Seizure Tracker Video Wins the AAN Neuro Film Festival - The film about Seizure Tracker submitted to the "2010 Neuro Film Festival" by film maker Peter von Elling wins both the "Film Maker" and "Fan Favorite" categories. Neurology Now "Dear Seizure Diary" - Seizure Tracker was one of the Seizure Diaries featured in the Neurology Now article "Dear Seizure Diary". The Seizure Tracker Team will walk in the "National Walk for Epilepsy" - The Seizure Tracker team will be walking in the fourth annual "National Walk for Epilepsy." Support epilepsy research and services by joining the team! 2009 - 2019 © SeizureTracker.com | All Rights Reserved.